Let’s build a better media in 2018! Home/The Co-operative, The Daily Mail/Let’s build a better media in 2018! A huge thank you to everyone who supported the latest Stop Funding Hate Crowdfunder. Together we raised over £80,251 in just 28 days – more than double the initial target. We’re already starting work on a series of new videos, and are developing plans to significantly increase our campaigning during 2018. The Crowdfunder was our response to a series of attacks on the campaign by the Daily Mail, Sun and Express. 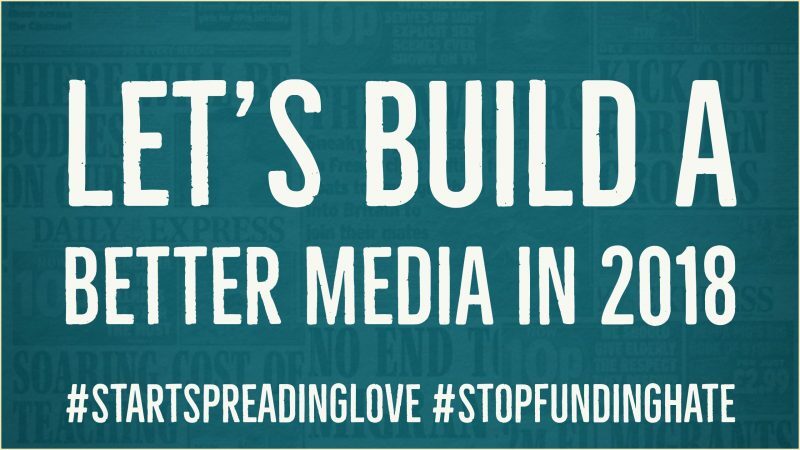 We wanted to demonstrate that Stop Funding Hate has strong public support – and that people across the political spectrum are deeply concerned about hate and discrimination in the UK press. We also believed that the hyperbole was a clear sign that the campaign was working: For a long time, the Mail, Sun and Express tried to ignore the concerns that Stop Funding Hate supporters have been raising. But by 5 December, The Sun was openly acknowledging that “this campaign is beginning to have an effect” – while nonetheless suggesting that “fewer than a thousand people… are actively involved”. We launched our Crowdfunder the next day, and saw hundreds of pledges within the first 24 hours. By 3 January, Stop Funding Hate supporters had raised more than £80,000 – with over 3,800 donations. During December we continued giving regular Twitter updates on the latest Daily Mail, Sun, and Daily Express advertisers, and commissioned a YouGov poll which found that just 10% of people think the Daily Mail is a positive influence on society. We also published the results of some detailed research by Ethical Consumer, giving an estimated “top 10” of the advertisers seen in the Mail, Sun and Express in the run-up to Christmas. We’ve begun 2018 with a renewed focus on the Co-op Group. Last year the Co-op promised to review its advertising after pressure from Stop Funding Hate supporters. The company – which is one of the UK’s leading ethical brands – acknowledged that some content in the Daily Mail, Sun and Express had been “incompatible with our values of equality, solidarity, self-help and openness”. But rather than pull its advertising, the Co-op decided to “use our contacts with publishers at every level to make the case for change”. They also promised to “look at using our advertising in these titles to tell their millions of readers about some of the things our Co-op is doing to tackle issues that we feel strongly about”. At the same time the Co-op told members that this was “only a start” and that “we must be bolder and braver still in calling out what our values are and make the case for them”. The issue of advertiser influence is contentious – and Stop Funding Hate has never called on any company to lean directly on a newspaper over its editorial policies. Many Co-op customers are nonetheless keen to find out more about how effective the company’s strategy has been. Last week, over 250 Co-op members signed an email to the Co-op National Members Council asking for an update on their “Approach to Advertising”. Leading up to the Co-op Group’s 2018 AGM, we’ll be making the case for the company to adopt an ethical advertising policy. If you’re a Co-op member and would like to be involved, please join our Co-op campaign mailing list. After a period of intense activity, Stop Funding Hate is also now taking some time to review the campaign, thinking about what’s worked well over the past year and what could be done better. This will include looking at how our website can be improved, and finding new ways for supporters to become more involved in Stop Funding Hate’s work. We’re putting together a survey which we plan to share soon – but in the meantime please do leave any general comments on our Facebook post.